Robert Esson or more commonly Easson, or even Aesson, was born at Millhead around 1745 we do not have a baptism record, but his father, also called Robert mentioned him in his will in 1799, and his brother William and his father were witnesses to baptisms of his children from time to time. .
Robert married Jean Reid from Towie in 1778, and they rented Balnacraig farm in Aboyne as was the custom for most. Balnacraig is a mile or so along a rough track which winds from the Deeside road west of Dinnet, north-wards past the small loch of Braeroddach, and then past Balnacraig itself. This farm should not be confused with Balnacraig House on the opposite side of the Dee, a couple of miles to the East. 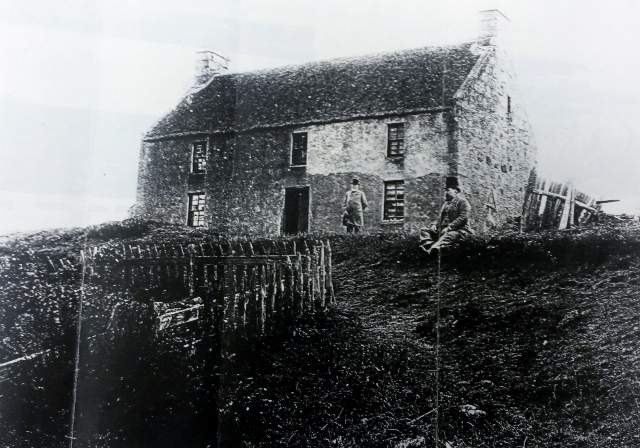 We can visit Balnacraig today and compare it with a photograph clearly of the house, and a map from around 1870. It has been suggested the two men in the photograph were Henry’s nephews, Robert and Henry Esson. If that is true, the appearance of the men is a little at odds with what we might expect of very active farmers. The picture is certainly not posed and seems likely to have at least been on a Sunday given the dress or in the day of a special occasion. The photograph would have been around the time Henry Esson’s nephew (Henry)was recorded helping with place names for the First Ordnance Survey name book for the area. Balnacraig looks southwards, over fields, and then across marshy ground and woodlands to the small loch of Braeroddach half a mile away. Beyond that there is a view to the other side of the Dee where the horizon is bounded by a line of heather covered hills. 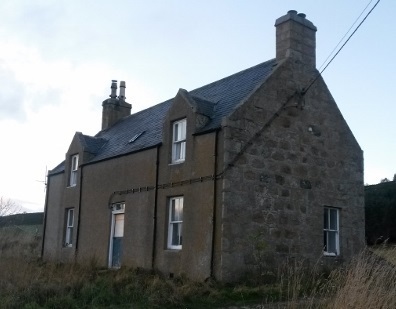 The house is easily recognised, although the thatched roof has been replaced and changed slightly. There are traces of older buildings, and a small, now overgrown, watermill reservoir to the back and side of the farm. Next to a farm track to the house an old lime kiln and deep drains remain as witness to improvements made to the land probably dating from the late 18th or early 19th century. Robert Easson became an elder of the parish in 1798. He and Jean clearly believed strongly in the importance of the church and a good education for his children. The family were not wealthy, but still prospered on the farm. They owned three farm horses for which they paid 4 shillings tax in 1798, and 12 shillings in 1800 according to records. Later records for Robert’s grandson show the farm was about 60 acres in size, cost £64 a year to rent, and employed four farm labourers. The couple had 7 children. All seemed to do quite well by the standards of the day. The four girls married well, and had quite large families, again with children who were often noted for their achievements. All three boys went to the local school and certainly in the case of John and Henry at least, to university. Catherine who married David Smith, the overseer for the MP and Earl of Aboyne for example, lived at Ferrar nearby and had ten children. Education in the North East of Scotland was extraordinarily good in those days. It was not common, but also not unheard of, for a poor farm worker’s child to reach the heights of academia and society by pursuing their education. Many other countries benefitted from this education, when opportunities proved few in Scotland. Scholarships and bursaries were available as a reward for hard work, although a good education did still take money. In their joint will, written in 1820, Robert and Jean ruled out payments to their sons Robert and John. This they said, was not out of disrespect, they said, but because the two boys had received all they could expect already. Robert added a note to confirm this, saying that that his parents had “during the years of my pupillarity and minority been at a considerable expense in maintaining, cloathing and educating me in a manner suitable and proper for my situation in life”. Robert, the eldest son took on the farm and stayed there after his parents died. He married Mary Forbes in 1816 and they lived on Balnacraig where they had 9 children. Alexander Gale, their nephew joined Henry in 1821 to work alongside him in the church I Canada. John and Henry went on to have extraordinary lives In Canada John was a successful merchant, and Henry was a leader of the church and in the development of its early education system.